PWC sound systems have only been available on flagship-level craft, but Sea-Doo has changed that, opening up more opportunities for consumers. When Kawasaki introduced the Jet Sounds stereo system in 2014 it generated a lot of buzz, but not the ultimate demand for onboard music casual observers might have expected. Part of the lukewarm reception was likely the cost; Jet Sounds was introduced (and continues to only be available) on the brand’s premier flagship, the Ultra 310 LX, a craft that currently runs $17,999. Though Yamaha jumped in to compete shortly after with a more powerful aftermarket system from JL Audio, it too came at a hefty price. Yes, you could fit it on most any 2013 and up FX (and later 2015 and newer VX) model, but the approximately $2,600 (FX) and $1,690 (VX) price tags (plus dealer installation) didn’t do much to stoke demand for on-the-water sound. In fact, onboard music kind of wavered for years after, with no sudden consumer demand for the feature. Price, again, was likely the biggest factor, but so too was the delicate issue of noise…and distraction. PWC manufacturers for years battled critics who harped on noisy craft, at one time likening the sound of a PWC’s engine and exhaust to a chainsaw. Research and development quieted models significantly before four-stroke engines took that noise level down even further. Sound, however, remained a delicate subject. After years of overcoming the issue, the last thing many industry types wanted to see was a craft with a blaring music from PWC sound systems annoying lakefront homeowners. Distracted drivers were also a concern. With a stereo pumping out a rider’s favorite tunes, would they still be alert to overtaking craft, or able to hear a boat horn? All may be reasons for the slow adoption of sound systems, but we’re betting demand increases in 2018 and beyond…and that Sea-Doo may finally be the one to tip the scales. 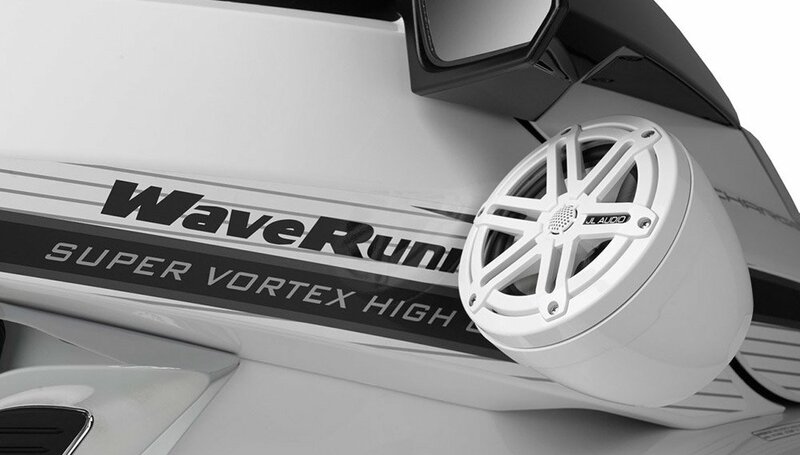 For 2018, the brand has introduced a sound system that is affordable (a $700 accessory if factory installed, a $950 option plus installation if installed after the fact by a dealer) and available on a multitude of 2018 models, including the GTX, RXT, RXT-X and Wake Pro platforms. Aside from price, how do the PWC sound systems compare? Both the Yamaha/JL Audio system and BRP Audio Premium get their music via Bluetooth, which allows the operator to simply select the unit on their phone and then cue up their favorite playlist. A basic control pad is installed on the craft to raise or lower volume, skip forward or back, and play and pause. Kawasaki requires a wired connection between sound system and source music. Your phone (or other source device) can be plugged into the system via USB and stored in a dry bag in the glovebox. There’s also the choice of a USB memory stick, housed within a watertight, cylindrical container. All three manufacturers locate speakers below the rearview mirrors, and direct sound back toward the driver. 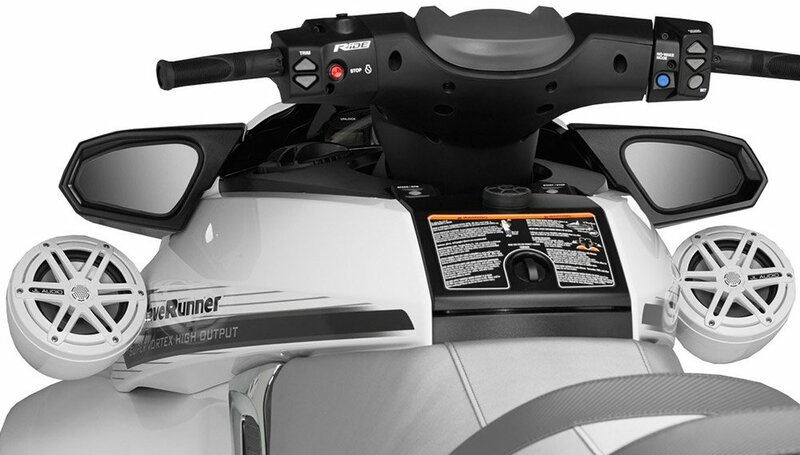 This gives ample volume to passengers in the saddle, but somewhat prevents the sound from carrying across the water and annoying the neighbors. Yamaha’s JL Audio system is by far the most powerful of the three offerings, with a 500-watt, four-channel amplifier and, on the FX, an 8.8” subwoofer. 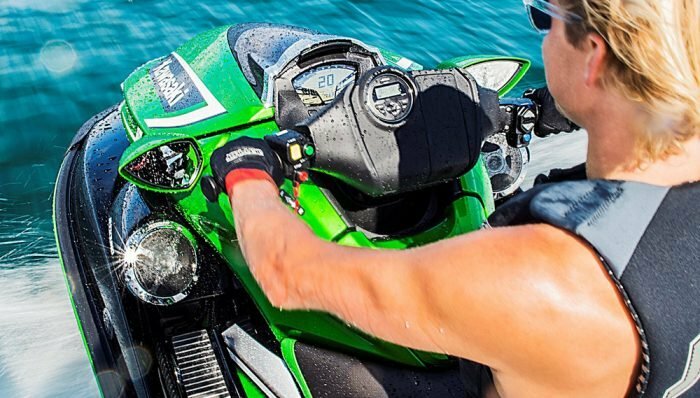 Kawasaki and Sea-Doo both go with 100-watt systems, with Kawasaki offering a pair of 30-watt speakers and two 20-watt amplifiers, Sea-Doo two 50-watt speakers. Yamaha clearly offers the system to host a party, with superior volume and clarity, but on the water Sea-Doo’s and Kawasaki’s offerings are probably less likely to annoy other boaters and waterfront homeowners by not providing such volume. 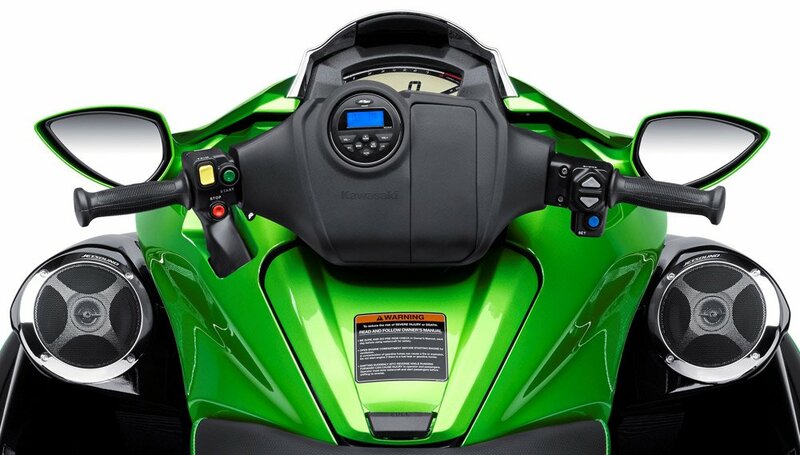 As to worries about battery consumption when the craft is not running, Sea-Doo’s Audio Premium shuts down after one hour, or when it senses low voltage, to maintain starting power. Kawasaki does likewise with Jet Sounds. The JL Audio system from Yamaha doesn’t come with a shutoff, but one can be installed. 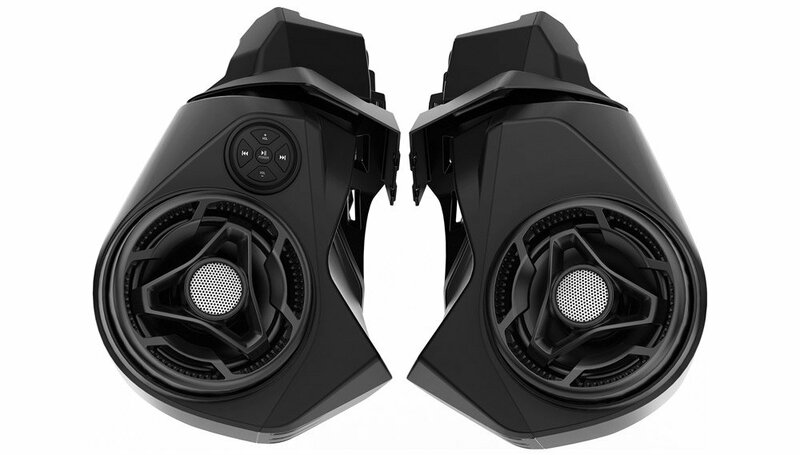 With the comparatively low price for BRP Audio Premium, I’m betting PWC sound systems gain some traction this time around, and if they do, lower-priced alternatives will be introduced from Kawasaki and Yamaha. That will require some responsible use to avoid problems. Yes, most boats have sound systems, but a boat is a more enclosed environment, lessening the sound travel. Still, boaters have been responsibly enjoying music for years. There’s no reason to imply that PWC owners won’t do likewise. Poll: What Is Your Favorite High-Performance PWC for 2016?